Later topic: Those from days of yore! I hope I put this in the right section since it is about type, sort of. 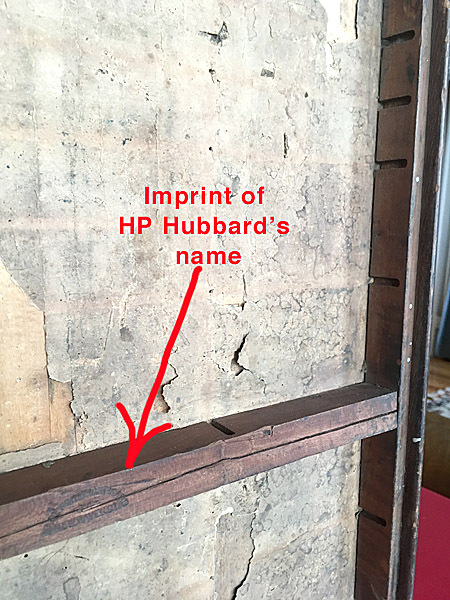 I am looking for any information regarding a man named H. P. Hubbard, whom, I believe, was a printer/publisher in New Haven, CT in the late 1870’s. I have not found an actual Biography about him but have found bits and pieces of information about a man of this name. The reason I am curios is because I have come into possession of an odd sized 2/3 type case (21-1/2 x 16-1/2). On it is stamped “Made for H.P. Hubbard, New Haven CT.” The stamp is in a half circle shape. Additionally, most of the nails used to assemble it are small, square, horse shoe-type nails. 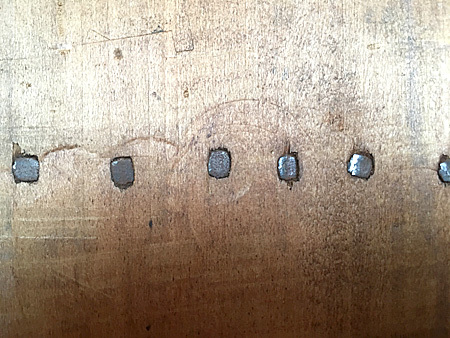 I have never seen square nails used to assemble a type case, although I assume that it was not odd a long time ago. So, I assume it is old and, based on the nails used, could possibly date to the late 1870’s or there about. If anyone knows anything about this fellow I would appreciate learning about him. Additionally, if there is any information about who or why someone would have made a type case specifically for Mr. Hubbard would be interesting. The Hubbard I have found was also known as an advertiser, selling ads for numerous newspapers around the country, so I could see him needing type cases to hold plates, back at that time. I assume a case made for one of the newspapers he may have worked at would not have his name on it. Pretty much, this type case has presented an interesting mystery to me. If anyone can shed any light on this for me I would appreciate it. Very interesting! But I assume that a printer/publisher doing such encyclopedic work might need a lot of small fonts of type for heads, titles, etc. and may have had some woodworker nearby who made his cases to spec. The nails look like they might be machine-made though they could also have been hand-made, but machine-made cut nails were available by then. I am not sure about round wire nails. You could check with the Connecticut Historical Society in Hartford — they might have something on him. The other odd thing that you maybe have not noticed is that this case originally had life as a LOWERCASE case (as opposed to a CAPITAL case). The dividing slats have been removed but the grooves for them are in the sides of the case. This was indeed “back in the day” when Uppercase and Lowercase cases were common (and generally found in newspaper shops). I think I had a pair of 2/3 news cases once — a real peculiarity. That is one of the cool things about letterpress. 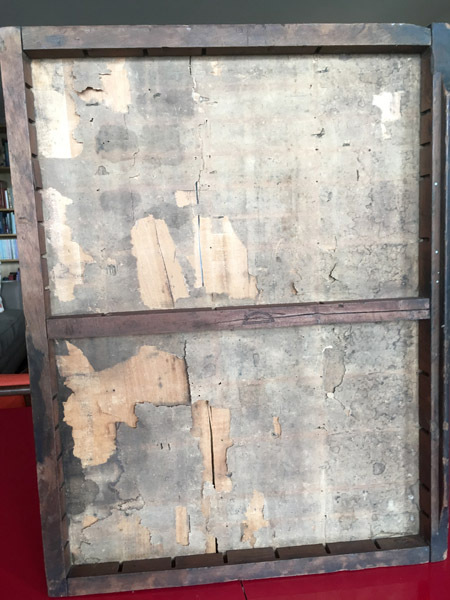 Since the stuff can last a long time, getting hold of a piece can take you back 100 or 200 years. I doubt these nails were hand-made but they definitely aren’t wire. There are some in it, probably added as time went by. I found no bio info on Hubbard but I did find his name enough tied to printing and world newspaper advertising in the 1870’s that it is a reasonable guess that this was his. His book listed about 30,000 printers all around the world AND their contact info and ad rates - and this a century before the internet. I can’t imagine how he gathered the info. I would love to find out who made it the case as well. It is just cool knowing th personal stories behind the equipment. I have emailed the New Haven Historical Society but have not heard back yet. I was hoping one of our folks might know a lot about southern Connecticut printing history.Briar is such a good source of info I often get lucky! Don’t forget the obvious, the New Haven Museum and the New Haven Public Library. You might want to call the reference librarian to see if there is any locally published biographical info or archival papers on Hubbard or his business. Or, you may have the opportunity to be the one person who goes to the archives and has the fun of actually digging up this long lost information. I encourage anyone who knows the history of their printing equipment to do a little research, write it down, and keep it in your studio. The next person to own that press, type stand, or paper cutter should have the opportunity to know this history and feel the presence of the “old printer” looking over their shoulder. Good luck. I emailed them but have not heard back. Calling or going to see them is the next step. Fortunately, I don’t too far away to make this inconvenient. I will post if I learn anything of use. Not sure who you would contact, but I would assume YALE may have information buried somewhere? I actually got in touch with someone at the New Haven History Museum and the associated Whitney Library. They were very gracious and extremely helpful. They had info about H.B. Hubbard in their reference material. He was a very successful ad-man in the 18770’s in New Haven and also did some newspaper publishing. He main claim to fame was actually publishing a 3 volume, 3,000 page publication listing every newspaper and bank in the WORLD at the time. He was also the ad-rep for each of those newspapers, thus the good income, I suppose. He assembled the info through the mails, missionaries and U.S. consulates. The amount of work in a publication like that done 150 years ago seems mind-boggling. But I assume the case was for storing ads for his various clients. Given the money he made and assuming he stored some of the plates, he must have had quite a few. I also thought to mention it to John Barrett since he is located in the “relative” neighborhood. He said that he, too, has seen a couple of the cases marked with Hubbard’s name over the years and constructed the same way. I found nothing about the maker but, of course, any good wood-worker could have done it. Based upon what John said, that may be the case because the builder put more into the cases than the usual manufacturer does it seems. Maybe that was Hubbard’s spec. Who knows. Anyway, most of the mystery solved. The history behind this stuff can be fascinating.